Over a month ago, Tracy Oliver (producer/writer) and I sat down at her kitchen table, mapping out a bare bones budget to continue our web series, The Misadventures of Awkward Black Girl. We were both jobless and neither of us could afford to continue to fund the series out of our own pockets after the premiere of Episode 6. Thinking about numbers automatically makes my mind go numb, and I hadn't gotten much sleep the night before. So, in typical fashion, I told her I needed to leave to get some coffee down the street and that she could get started on budget-planning without me. After listening to her chastise me for always finding an excuse to prolong getting work done, I drove to the nearest gas station with $1.10 in my pocket, certain that a small cup of coffee wouldn't exceed that amount. It was $1.25. When I returned to her apartment empty-handed because I couldn't afford a $1.25 cup of coffee (my bank account was in the negative at the time), we decided that in order to continue this web series, we would have to solicit funding. So, we drafted a Kickstarter campaign to help fund the remaining episodes of the season. When I initially created the series in January, I had a camera, a temporary office job and no budget. The "Awkward Black Girl" character had been swimming around in my head for two years and I knew in my mind that if I didn't shoot the first episode at that very moment, I never would. So, I called up one of my best friends from high school, Devin Walker and asked her to shoot the episode for me guerrilla style. "I'm down!" she exclaimed, "But you have to tell me what to do." I then reached out to another friend from Stanford, choreographer/dancer Andrew Allan James, and asked him if he'd play "A," my bugaboo office fling. I offered him gas money for his trek from Hawthorne to Baldwin Hills, L.A. and he scoffed, "Are you kidding? You don't have to pay my gas. Please. I want to do this." This would become the general attitude of our wonderfully amazing cast and crew. Tracy came on as a producer by Episode 4, and made it her mission to elevate the production quality of the show. She found an amazing cinematographer, Shea Vanderpoort, who volunteered his time and equipment because he believed in the series. As the series began to gain popularity by word of mouth and through social networking, I began to receive e-mails from viewers, asking if they could donate to help the show. If people were willing to donate without my asking, starting a Kickstarter was a no brainer. Deciding how much to ask for through Kickstarter was the hardest part. We were initially going to ask for $5,000 because we were skeptical about how much people would be willing to donate to a web series. Also black people, unfortunately, have a stigma associated with supporting one another. But, after mapping out a budget and strongly considering what we needed to increase the show's production value and compensate the crew and actors who volunteered their time, month after month, we decided it was time to stop shortchanging ourselves. We had an average of 60,000 viewers at the time. If just half of those viewers gave $1 each, we could raise $30,000 and produce a better, more professional show. So, after much back and forth, we decided to ask our viewers to help us raise $30,000. While Tracy and I initially felt that we were being ambitious in asking for $30,000, the first day demonstrated to us that fans were willing to put up the money to keep us going. The cast and crew posted the campaign on their respective pages (Facebook & Twitter) and we were able to raise $4,000 in less than 24 hours. Blogs also played a HUGE role in terms of spreading the word about our campaign. While Tracy and I strategized about reaching out to some of the publications who had interviewed me in the past, I was pleasantly surprised to find that sites like Shadow & Act, Clutch Magazine, TheLoop21, Black Girl with Long Hair, and countless other blogs took it upon themselves to post the link to our campaign, urging their readerbase to support it. Many presented ABG as opportunity for viewers to put their money where their mouth was and support the change in media they wished to see. Today, we have raised over $44,000 and counting through Awkward Black Girl's devoted support system. I witnessed firsthand as viewers mobilized through Facebook, Twitter and Tumblr to repeatedly urge their friends and acquaintances to support our campaign, as if it were their own. All in all, this campaign has demonstrated to me that: 1) people are tired of mainstream media's limited and confined portrayal of people of color; 2) they are very much willing to unite behind a project they believe in to change that limited portrayal; and 3) people ARE willing to support and watch web series as a legitimate form of entertainment. The majority of backers for this project were complete strangers to Tracy and I, and it has been extremely touching to see how devoted they've been to ensuring a different depiction of themselves on screen. I am happy to report that because of the success of our campaign, we will be able to bring Awkward Black Girl viewers five more episodes, including a grand season finale. We are still accepting donations via Kickstarter until Thursday, August 11th at 12:55pm PST/3:55pm EDT and we can't thank you enough for your support thus far! 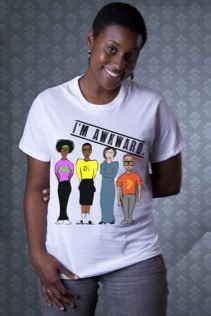 Issa Rae is a producer/writer and creator of "The Misadventures of Awkward Black Girl". Visit her official website HERE.